CATHOLIC OPEN ONE DECADE ROSARY CHAPLET COGNAC AMBER & STERLING SILVER ENTIRELY HAND MADE WITH GEM STONES AND PRECIOUS METALS, UNIQUE ROSARIES TO CHERISH AND OFFER. All my Rosaries and Chaplets are hand made using only precious or semi precious stones as well as precious metals. They are unique and a real pleasure to handle. made using the strongest materials and will last for long years. 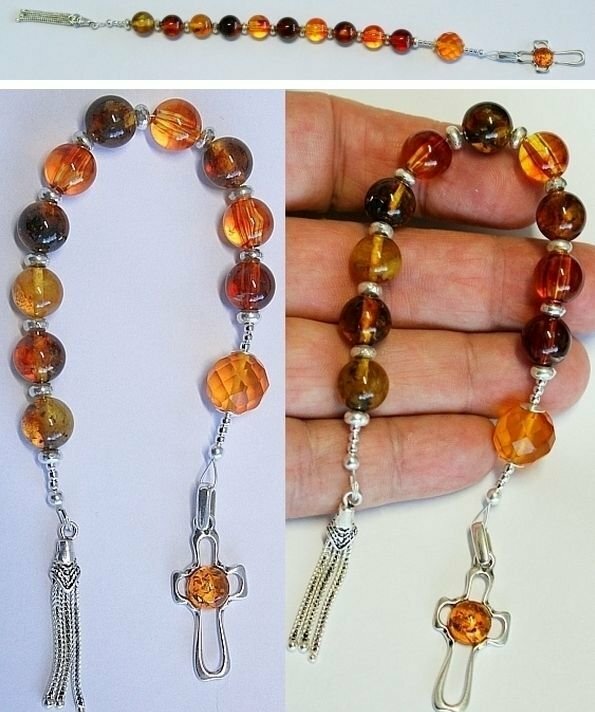 This OPEN & STRAIGHT, very original, one Decade Chaplet/Rosary in this listing has the following characteristics: 1- 10 mm Round COGNAC BALTIC AMBER beads for the Ave Marias. 2- 12 mm Round FACETED COGNAC BALTIC AMBER bead for the Pater Noster. 3- STERLING SILVER AND BALTIC AMBER CROSS : 35 X 15 mm. This cross is hand Made in Poland. 4 - Sterling Silver beads and spacers as well as sterling silver tassel opposite the Pater bead.Total length : 23 cm This a very original, attractive and rarely seen and pleasant to handle straight chaplet. Extremely practical to carry on all occasions. . NO RESERVE - Low starting price for a VERY RARE item !!! This is a magnificient item that you will greatly enjoy or that would make a fantastic gift. My selling principle is : " SATISFACTION OR REFUND " AND IT APPLIES 100 %. I am ready to refund in totality any item sold by me if you are not fully satisfied with your purchase NO QUESTIONS ASKED - NO CONDITIONS BID WITH COMPLETE CONFIDENCE Check my other auctions Condition: New andale andalesell Payment Options: PayPal Shipping Options: Domestic shipping: Fixed Shipping Charges. International shipping: Fixed Shipping Charges. Shipping Carrier Domestic International Shipping Locations Standard $0.00 - - Intl Standard - $0.00 Worldwide I will ship to: Switzerland, Worldwide Payment Policy: PayPal: Paypal is the form of payment that I preffer and which allows me to ship your items immediately . Please use it ! Tesbihci - The Swan Collection - IMPORTANT We normally ship twice a week : on Tuesdays and Fridays. But during peak periods we ship 4 times a week. All orders are automatically sent insured, by registered airmail with recipient signature requested for delivery, at no extra cost. Thank you for your business. Vendio Images: More than just a pretty image. Achieve Selling Success with Vendio Research. Vendio provides powerful selling automation for sellers of all sizes. FREE Counters used in millions of listings - Vendio! On Dec-22-15 at 11:15:59 PST, seller added the following information: Add a map to your own listings. FREE Trial !